Oil on panel, 49,5 x 66 cm. Mediterranean harbour scenes were popular subjects for the Dutch Golden Age painters around the middle of the 17th century. Painters such as Jan Baptist Weenix and Jan Asselyn imported this subject to the Netherlands following their stays in Italy. Although it is unlikely that Abraham Storck ever travelled to Southern Europe himself, this did not prevent the artist from painting imagined scenes of Mediterranean harbours that were inspired by the marine painter Jan Beerstraaten. 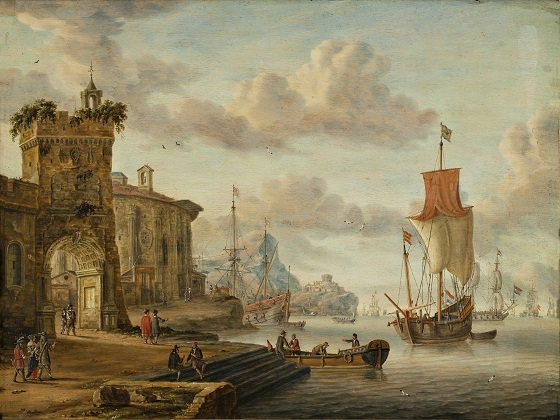 In this painting, the massive antique buildings form the frame around a scene from a Mediterranean harbour. The distinctive Mediterranean light has been rendered using an almost golden colour palette, which together with the staffage in the foreground and the antique architecture gives the scene a lively and picturesque appearance.